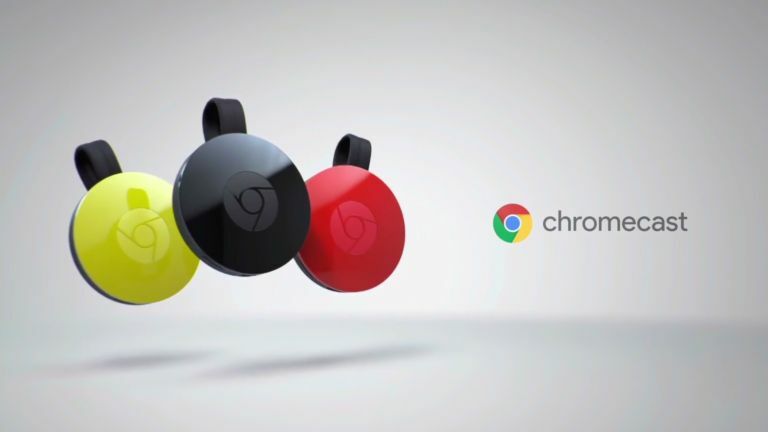 The new Chromecast devices have finally been unveiled by Google and not content with making your TV a far smarter device, with the new Chromecast Audio it's also looking to do the same for your stereo too. Both devices have just been shown off at the latest Google event, with a new hockey puck design and beefed-up WiFi capabilities to offer high-res streaming to and from your devices. The new Chromecast runs in almost exactly the same way as the original device - it plugs directly into a spare HDMI port on your television and allows you to 'Cast' from your phone or tablet and have the output on your screen. It connects to your home network, running via your router rather than being directly connected between device and TV. That way you can carry on using your mobile device without interrupting what's going on the screen, so if you get a phone call you can chat away without that being broadcast to everyone watching the TV. The most obvious thing is the change in shape. The new Chromecast is a 51.9mm diameter disc with an attached, flexible HDMI cable. That's quite a departure from the USB dongle aesthetic of the original device. And it also means the new Chromecast can fit in a wider range of televisions without needing a HDMI extension to fit. You can also choose a range of colours too. The traditional black device is available at all retailers, while the lemonade and coral options are only available from the Google Store exclusively. But it's the new hardware that will make more of a difference. The improved WiFi 802.11ac connection now allows access to the 5GHz band as well as the standard 2.4GHz band. This offers it greater bandwidth to stream higher bitrate content. It's also got a newly designed antenna array which allows it to keep the signal strong to keep buffering to an absolute minimum. The new Chromecast has wide compatibility. Obviously it is totally compatible with Chromebooks and Android devices, but also iPhone, iPad and Mac and Windows laptops. There are a host of new applications that offer direct 'Cast' buttons from the app themselves. Google Photos, Spotify, 7digital and iPlayer Radio are all now Cast-enabled. There are also a bunch of existing applications already Cast-enabled, such as Netflix, YouTube, iPlayer, BT Sport and NOW TV. The new Chromecast application has also been completely redesigned to help discovery, showing different options for you to watch at any one time. All the options it offers are sourced from the applications which are already installed on your phone or tablet. It's essentially Universal Search for everyone. Google doesn't want to let the likes of Amazon and Apple run off with the big-screencasual gaming fun with their new Fire TV and new Apple TV respectively, with the new Chromecast Google is looking to create more mobile games that are Cast-enabled to be played on your TV. It's not just a question of mirroring the screen either as the device itself is being touted as the controller which will offer new ways of interacting with the games. Working almost exactly like the video-based Chromecast, the new Chromecast Audio will do for the off-grid stereo what the original Chromecast has done for the unconnected television - all for the price of a cheap pair of headphones. The Chromecast Audio simply plugs into any spare AUX/line input, RCA or optical input on your existing stereo and will turn it into a network connected audio player. Again it plugs into your home network, so you can still go ahead and use your phone or tablet for whatever you want without interrupting your Spotify stream. And again, it's all using the same improved WiFi connection that the new Chromecast is rocking so high-res audio, from the likes of 7digital, is definitely on the table. All the Cast-enabled audio applications that have been announced around the new Chromecast are perfectly ready for the Chromecast Audio - having Spotify on there is a definite boon running straight out of the app itself. As well as using your own devices you can also enable 'Guest Mode' to allow people you don't want to give your WiFi password to send music to your Chromecast Audio. Google is also looking to crush the multiroom audio market too because it's set to upgrade the Chromecast Audio later this year with a multiroom synchronisation OTA update. Now why not check out our roundup of the best media streamers?